Onions, and close relatives like shallots, leeks, chives, and garlic, are usually grown for their bulbous roots, which are pungent and/or sweet in varying degrees. Some are also grown for their green tops. They have a long history as cultivated plants; onions were an important food item in Egypt as early as 3200 BCE. Many traditions have been attached to them. They are said to ward off garden bugs, vampires, and heart disease. Onions can be grown from seed, transplanted as seedlings, or grown from sets. Onions need cool weather to grow their green tops and warm weather to ripen the bulbs. They don't begin to form bulbs until both temperature and day length are suitable for the variety, which means that distance from the equator is important in growing onions. In areas nearer the equator, day length does not vary greatly from one season to the next, while in areas further from the equator, the difference in day length is dramatic. 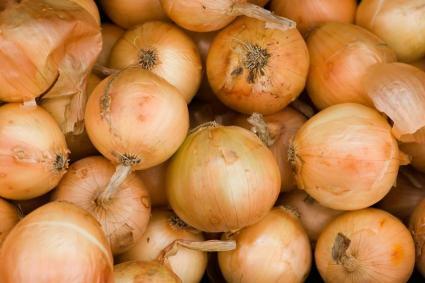 'Short day' onions are suitable for areas with even day length, such as the southern part of the United States; they will form bulbs too soon if grown further north in response to the long summer days. These onions do not usually store well. 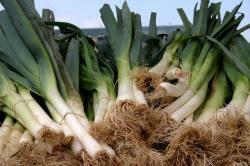 'Long-day' onions are suitable for the north; they don't form bulbs in the south because the days aren't long enough. They need fourteen to sixteen hours of daylight to bulb satisfactorily. They generally store better than 'short day' varieties and have a more pungent flavor. Onions like plenty of sun! Onions like plenty of moisture, but they also require good drainage. Mulch will help to preserve moisture. 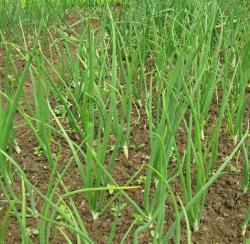 A sandy, fertile loam is the best soil for growing onions. If the soil pH is below 6.0, add a little lime, and dig in plenty of organic matter along with it. A balanced fertilizer is also useful. Onions seed only remains viable for a year or two, so be sure you plant fresh seed. If you're sowing seed directly in the garden, plant either very early in spring or in the fall for an overwintered crop.Make a wide furrow, and soak the soil thoroughly. Sow the seeds and cover them with one-half to one inch of fine soil. Keep them evenly moist. If you're starting seed indoors, sow them early. Use the starting medium of your choice, and cover the seeds. Keep them at about 60 degrees Fahrenheit, and keep them moist. When the seedlings are about six inches tall, trim the tops back to three inches and transplant them into the garden. Sometimes you can purchase onions seedlings from a garden center, or you can start your own seeds indoors. Make a wide furrow and water it lightly. Plant seedlings three to five inches apart. Poke a hole in the furrow with your finger or a pencil, set the seedling in place, and gently firm the soil around it. Onion sets are usually purchased by weight. If you choose your own from a bin at the nursery, choose the smallest ones. Plant them two to four inches apart with the tip up. The tip should barely show above the soil - or, if you have trouble with hungry birds, it can be just below the surface. Water them well. If you sowed seed directly in the garden, gradually thin the plants until the remaining onions are three to five inches apart. The thinned onions can be eaten as scallions. Keep the soil moist and free from weeds. Applying mulch when the plants are about a foot tall is helpful. Side dress with a low-nitrogen fertilizer occasionally. If seed heads develop, cut them off. You can eat onions before the bulbs mature; in fact, many people prefer "green onions" to mature ones. It's easy to when onions are mature: the tops yellow and fall over. There's no need to bend the tops to try to hurry maturity; they'll fall over by themselves when the plant is mature. After the tops have fallen, pull up the onions and set them aside to dry and cure. If the weather is sunny, they can cure right on the ground. If it's rainy, move them to a warm, dry place. Some people dry onions on a screen for better air circulation. Don't cut off the tops. Let them dry too, until the necks of the onions are brown and rather thin. You can store onions by braiding the tops together in a French braid and hanging them somewhere dry and cool. Weave a strong piece of twine into the braid, so the weight of the onions won't break it. Onion thrips are occasionally a problem. They can be hosed off with a stream of water or washed off with a soap spray. Onions are rarely eaten by pests. In fact, onions or chives are often used as companion plants to repel deer, rodents, and other garden pests.